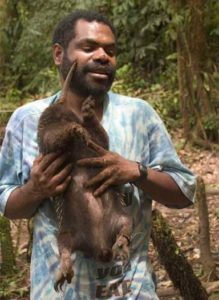 Mr Muse Opiang is an experienced conservation biologist from the Papua New Guinea Institute of Biological Research. He has an interest in sustainable forest management practices and conservation of forest fauna and flora and has conducted pioneering field research on the Long-beaked Echidna—the largest of the monotremes and a critically endangered species. Muse is the only person to have successfully studied this amazing animal, which is threatened by hunting in PNG. Along with his wife and young son, Muse spent thousands of hours catching and radio-tracking echidnas in the rainforest to learn about their habits and home range. The Tasmanian Forest Practices Authority (FPA) was fortunate to host Muse as a Crawford Fund intern between July and November 2015. Muse worked with FPA specialists Sarah Munks and Peter McIntosh to develop technical guidelines on natural and cultural values, similar to the ones used by Tasmanian forest planners, to support the PNG Logging Code of Practice. 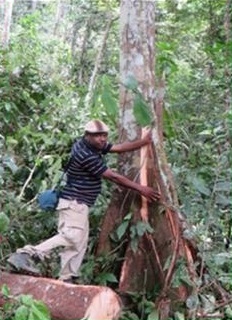 The logging code of practice is administered by the PNG Forest Authority, and a team of FPA specialists were involved in the recent revision of the code. PNG scientists, including Muse, contributed their expertise in the development of provisions for natural and cultural values. 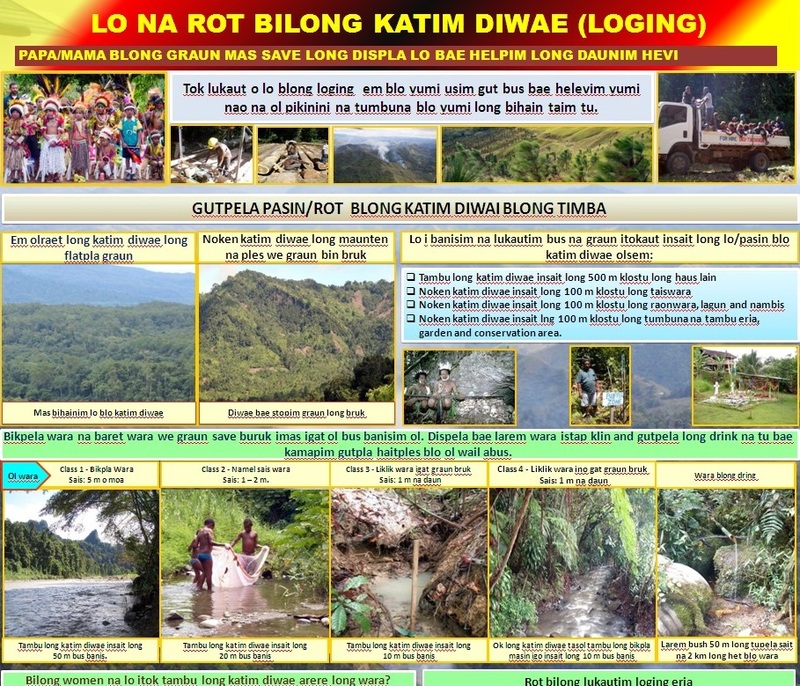 With over 800 languages in PNG, communicating the main messages and management ideas from the PNG Logging Code of Practice to everyone involved is a daunting task. Translating the English versions into the language that is common across PNG (Tok Pisin) has been difficult as many of the English words can’t be directly translated. Training forest workers, planners and landowners to identify the values covered by the code and their management is important for sustainable forest management in PNG. The social, political and cultural environment in PNG means that unusual strategies are required to conserve natural and cultural values. Raising awareness of the values and ways to reduce impacts, in a country with an extremely low literacy rate, requires a wide variety of innovative approaches. Simple, readily available and user-friendly information is crucial. Muse has made a good start with his technical guidelines and landowner poster produced as part of his Crawford Fund training project. It is hoped that these guidelines will be adopted by the Forest Authority in PNG, the major logging companies, the local NGO, community groups and landowners. The guidelines Muse has developed are accompanied by pictures and diagrams illustrating the values and ways to reduce land-use impacts.